Living close to Birmingham we couldn’t resist visiting the newly refurbished Birmingham New Street station, and the newly revamped shopping centre called Grand Central. The name Grand Central comes from the original name of Birmingham train station when it opened back in 1854, before it got that seventies make over. When we were looking around we were impressed by the number of interesting places to eat that had also newly opened. 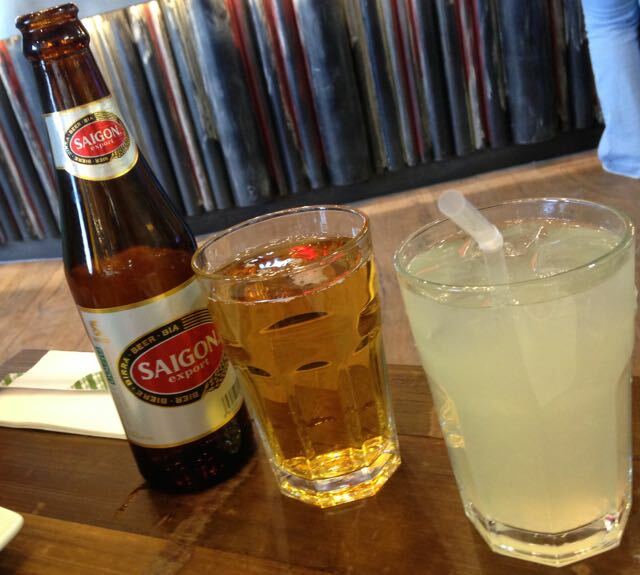 Loving to try something new we decided to eat at Pho, a trendy looking Vietnamese restaurant that over looked the new station. We arrived just before 12 o’clock and the place was about two-thirds full. We were given a paper menu and left to explore all the interesting sounding dishes, the names of which are shown in Vietnamese, but with good English explanations underneath. It is always fun to order to the waitress trying to pronounce things you have no idea how to pronounce, and await the polite correction. 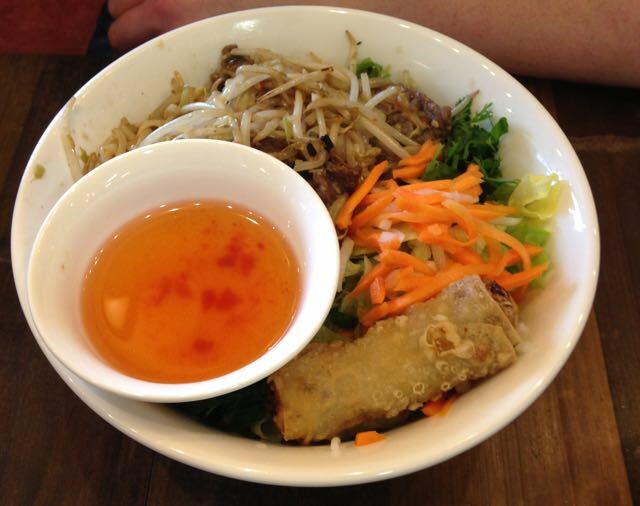 As we had never had Vietnamese food before this was completely new territory. 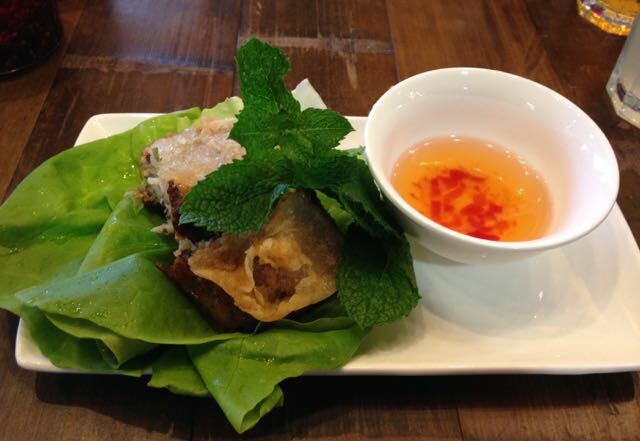 I went for Nem Hai San for my starter, followed by Com Tam Rang for my main. Essentially a seafood spring roll to be followed by a chicken and shrimp dish with rice. The place was very busy by the time we ordered, (we stared at the menu a fair bit) and I was worried the service might be slow, but drinks arrived very quickly and the starters followed shortly after. On a side the drinks were lovely also, I had a homemade lemonade which was very pleasingly zingy, and Spectre went for a Vietnamese beer to keep the theme. My starter didn’t look exactly how I had picture a Spring Roll, as it was quite a bit fatter, but you could see it was full of prawns, crab meat and pork. The dipping sauce it came with was moderately hot but sweet, and complimented all the flavours. It was quite filling though, but very tasty. 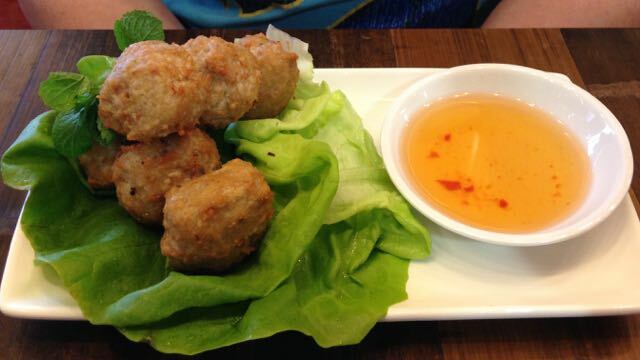 Spectre went for the Nem Nuong, which was pork meatballs. It arrived as generous portion and he found them to be flavoursome, and perfect dipped in the spicy sauce. My main course was a dish of rice with all the goodies mixed in. It came with a ginger sauce on the side, which I didn’t eat much of as I’m not the biggest fan of ginger. 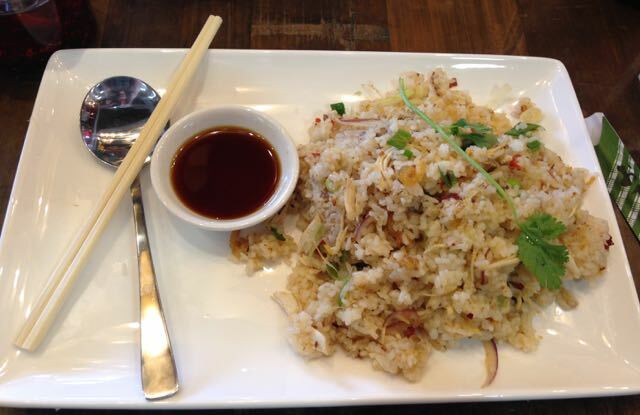 The rice dish was lovely and spicy, I’d say a good medium, enough to get a burn on the tongue that is tingly rather than hot. The chicken pieces were moist and succulent and broke up the textures perfectly. The shrimps added flavour, but were quite small, although there were plenty of them mixed in. Spectre went for Beef Bun, a bowl which came with noodles, beef, beansprouts, salad, dipping sauce, and a more recognisable Spring Roll on the side. His dish was quite varied and he mixed things up to eat them. 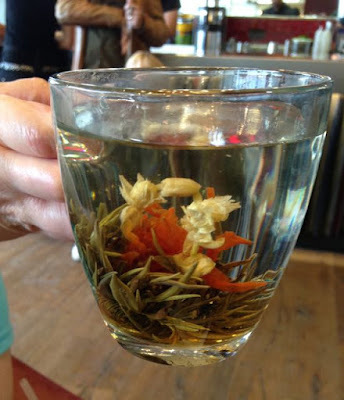 He said; “That was fantastic” when he licked his lips and finished the bowl, which is about at positive as he can be. 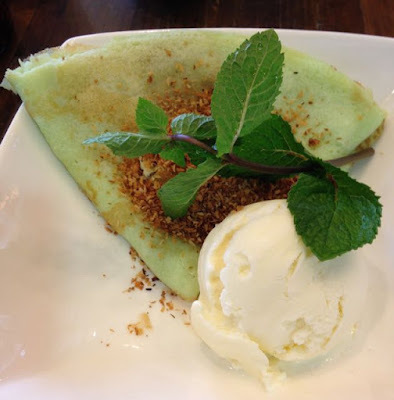 For dessert I had Banha La Dua, the Pandan Pancake. It was green when it arrived, and had a good coating of moist roasted coconut. The texture of the pancake was soft and spongy and the coconut added a lovely creaminess to the flavour. It came with a scoop of coconut ice cream, which was silky and certainly would be soothing for those whose main courses proved too hot. 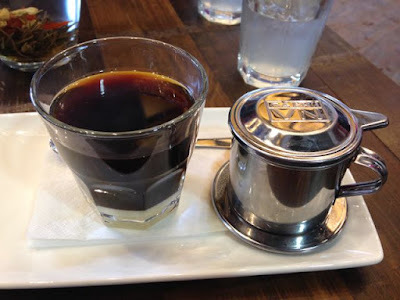 For drinks afterwards I tried a Vietnamese Coffee, which came with a layer of condensed milk at the bottom(!) which was a nice strong but sweet drink. Spectre went for a Jasmine tea which was the whole flower in a mug, it opened once hot water was added. I thoroughly enjoyed our meal and trying out a new place. The food was spot on, interesting and varied and somewhere I want to go back to so I can explore the menu further. 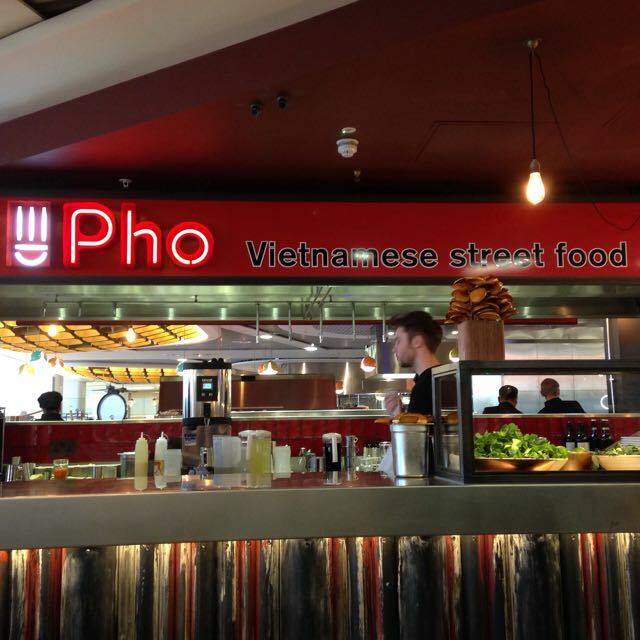 I spoke briefly to a member of staff who said the restaurant prides itself on its authenticity to the traditional Vietnamese recipes, which means you get the chance to try a bit of a different culture right in the middle of the UK, and the rail network.